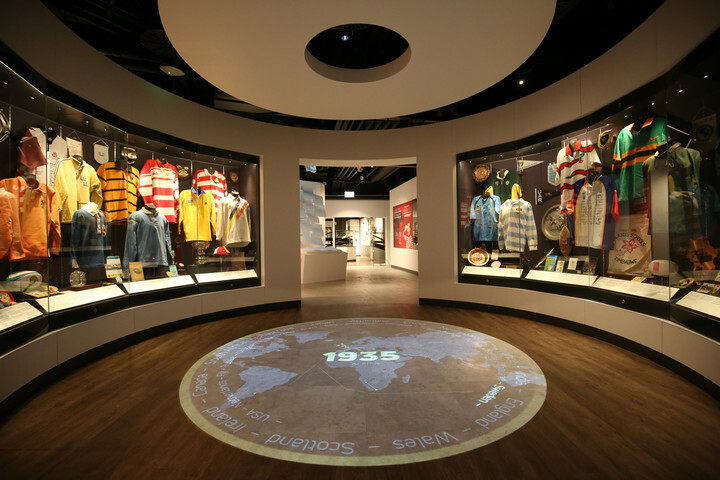 Twickenham Stadium has unveiled a completely new and totally unique World Rugby Museum within the south stand. Featuring cutting edge interactive displays, the new museum is the ideal location for meeting and events delegates at Twickenham to explore. The museum provides both a perfect breakout space and an incentive option to events taking place at Twickenham Stadium. Event organisers can use it as part of a wider social itinerary, a drinks reception, or as an added bonus for delegates to stay on and explore the home of England Rugby with a stadium tour. The World Rugby Museum is the definitive home for everything and anything about rugby. Featuring exhibits from around the world it represents rugby from different countries and in all its forms, from the very beginning of the sport. "This is a really inspirational space that reminds people that they are at an extraordinary event within the home of England Rugby," comments Nils Braude, Catering & Conference Events Director, Twickenham Experience Ltd. "It's an unusual and highly visual space that's great for a champagne reception, or just to allow delegates to stroll around in their own time. It's perfect for any delegate with even a passing interest in rugby, its interactive, informative and fun." "The museum houses the world's most prestigious collection of rugby memorabilia," says Museum Curator, Phil McGowan. "This includes commentary, film and match-footage from the most iconic moments, memorable tours, and greatest players in the history of what is the world's most dramatic team sport."